Oftentimes, a woman begins to think like a mother as soon as the stick turns pink. She may ask herself: What can I do to create the healthiest most nurturing environment for this fetus to grow and develop physically? She may also wonder if there are actions she can take to help build her baby’s brain health and intellect. David Perlmutter, MD, FACN, ABIHM, board-certified neurologistand author of Raise a Smarter Child by Kindergarten, offers these tips for expecting mothers about how they can boost their babies’ developing brains. Make sure you’re getting adequate DHA in your diet during pregnancy. DHA, or docosahexaenoic acid, is an essential omega-3 fatty acid that plays a critical role in brain, immune system and eye development. Because your body’s reserves of DHA will be selectively given to the fetus, it’s important to replenish your body’s reserve of this fundamental fat. Eating fish helps replenish DHA, but many fish are contaminated with mercury and other toxic chemicals, so taking an algae-derived DHA supplement is best. There are many prenatal vitamins that contain added DHA, as well as more than 500 food products that have been enriched with DHA derived from algae. 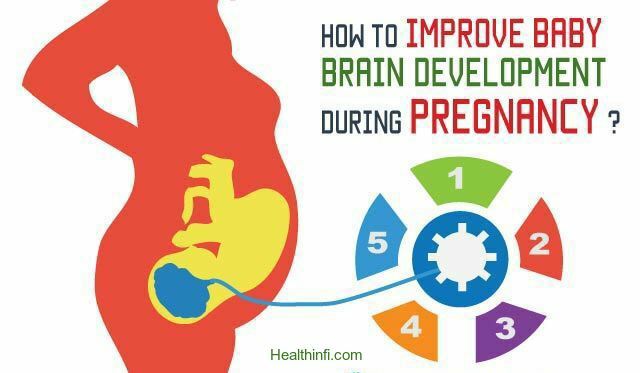 DHA remains a vital nutrient for brain development after baby is born. That’s why many infant formulas have added DHA. But the best option by far is to breastfeed if at all possible. Keep in mind that the DHA content of breast milk is substantially higher when mothers add DHA to their diets. Breastfeeding women are often advised to take a daily algae-derived DHA supplement supplying about 600 mg of DHA. Keep in mind that during pregnancy you are in complete control over the environment your future child experiences. Pregnancy is not the time to paint a room, expose yourself to potentially dangerous cleaning products, smoke cigarettes, expose yourself to secondhand smoke or consume foods that may harbor dangerous levels of pesticides. These exposures may lead to compromised brain function. Exercise is important and encouraged, but excessive exercise that keeps your body temperature elevated for a prolonged time should be avoided. One of the best exercises during pregnancy is swimming. Not only is it good for you from a cardiovascular perspective, but it doesn’t elevate your core body temperature. Yoga also gets the nod, but avoid the “hot yoga” classes that have become popular. Stretching and yoga poses are a great idea, but make sure the room is comfortable. Finally, you may be overwhelmed by the number of toys, games, dolls and music CDs that promise to enhance your child’s brain development. While there may be some good products out there, don’t underestimate the powerful influence of the spoken word in terms of your baby’s brain development. Get face to face with your infant and talk with as much animation as you can muster. Singing to your baby does wonders for brain development, even if you think you don’t have the world’s greatest voice. It’s all about the interaction. Certain foods have been proven to positively affect your baby’s memory and capacity to learn, and others can hinder proper brain development. Here, what to eat and what to avoid while you’re pregnant. Fish, rich in omega-3 fatty acids, may boost your baby’s brainpower. In a study from Harvard Medical School, the more fish women ate during the second trimester, the higher their babies scored on a mental-development test at 6 months of age. Omega-3s are found in brain-cell membranes, so there are plenty of ways they can influence brain function, says Lisa Eliot, PhD, assistant professor at Rosalind Franklin University of Medicine and Science, in Chicago. If you don’t like fish, talk to your doctor about taking a fish-oil supplement. Fish is good for your baby’s brain, but you do need to take a few precautions. Mercury contamination in some fish may be harmful. The Food and Drug Administration advises all pregnant women to avoid shark, tilefish, king mackerel, and swordfish completely, since they contain the highest levels. Some lower-mercury options: salmon, catfish, pollack, whitefish, tilapia, and shrimp. Even with these varieties, you should limit all fish to 12 ounces (about two meals) per week. And opt for canned light tuna over canned white albacore, which has more mercury. Produce contains antioxidants, which are good for your baby. “Antioxidants protect the baby’s brain tissue from damage,” says nutritionist Elizabeth Somer, RD, author of Nutrition for a Healthy Pregnancy. Choose deep-colored produce — like dark leafy greens, papaya, blueberries, and tomatoes — for the biggest antioxidant punch. Just remember to wash all fruits and vegetables thoroughly, even fruits that have a rind (since cutting it will drag germs through the flesh). Though fetal alcohol syndrome is associated with heavy alcohol abuse during pregnancy, even moderate amounts of beer, wine, or liquor can harm a baby’s brain, according to the March of Dimes. Light to moderate drinking can lead to problems with learning, attention, memory, and social skills down the road. Your body needs more protein right now to build cells and make hormones for your growing baby. In fact, your protein intake must jump by 10 extra grams per day. Some good protein boosters: a yogurt smoothie at breakfast, a cup of bean soup at lunch, peanut butter on whole-grain crackers for a snack, or a 3-ounce portion of lean beef (tenderloin and sirloin are good choices) at dinner. Your iron intake needs to double during pregnancy, since iron helps deliver life-sustaining oxygen to your baby. Trouble is, many women enter pregnancy already deficient, says Somer. If your baby’s deprived of oxygen in the womb, the risk of poor growth — and lower IQ — increases. Ask your doctor to test you for iron deficiency. Then make sure your diet includes iron-rich foods like lean beef, chicken, legumes, and fortified breakfast cereal. If you’re currently a normal weight, gain 25-35 pounds. f you’re currently overweight, gain 15-25 pounds. If you’re currently underweight, gain 28-40 pounds. Wash your hands, cutting boards, and knives in hot, soapy water before and after preparing food. Cook meats to at least 160 degrees F.
At restaurants, don’t order meats rare or medium rare. Skip tiramisu and Caesar salad dressing made with raw eggs. Yoga and swimming are two of the best exercises for pregnant women. Swimming takes much of the pressure off your body while providing quality resistance to keep muscles firm. Swimming also keeps you from sweating excessively or raising your core body temperature, which can be hazardous to your baby’s health. Yoga provides muscle stimulating workouts, enhanced balance and coordination and peace. Yoga can help reduce many of the pain and waddling effects of pregnancy.